Explanation: What's happened to the sky? Aurora! Captured late last month, this aurora was noted by Icelanders for its great brightness and quick development. 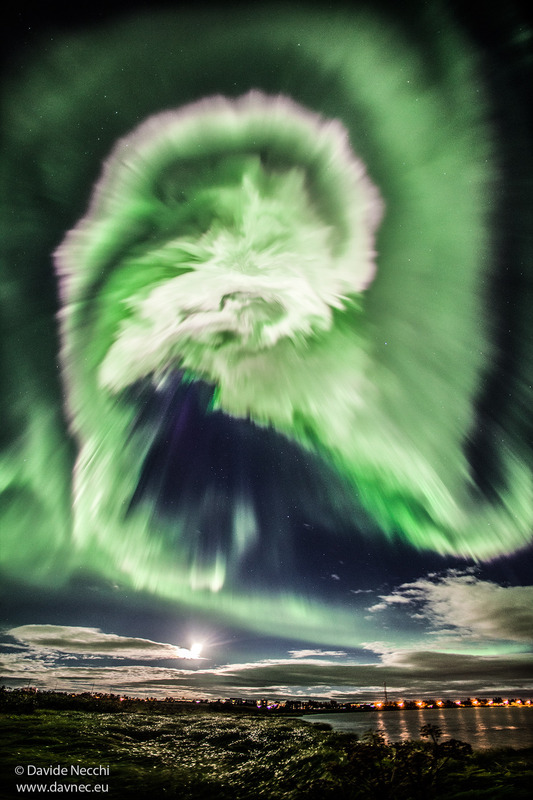 The aurora resulted from a solar storm, with high energy particles bursting out from the Sun and through a crack in Earth's protective magnetosphere a few days later. Although a spiral pattern can be discerned, creative humans might imagine the complex glow as an atmospheric apparition of any number of common icons. In the foreground of the featured image is the Ölfusá River, while the lights illuminate a bridge in Selfoss City. Just beyond the low clouds is a nearly full Moon. The liveliness of the Sun -- and the resulting aurorae on Earth -- is slowly diminishing as the Sun emerges from a Solar maximum of surface activity and evolves towards a historically more quite period in its 11-year cycle. In fact, solar astronomers are waiting to see if the coming Solar minimum will be as unusually quiet as the last one, where sometimes months would go by with no discernible sunspots or other active solar phenomena.